Plans for its formation appeared in January 1918 for deployment to Egypt in April as a DH9 equipped bomber unit. Deployment was later changed to June and then July but on 31 May, its formation was deferred, as a result it never formed in WW1. It eventually formed at Risalpur from 'B' Flight of No 5 Squadron on 15 October 1941. Equipped with Audaxes, these were taken to Dum Dum in November 1941 to provide air defence of the region. In March 1942, the elderly Audaxes were replaced by Mohawks but in April these went to No 5 Squadron and it received Buffaloes instead. However, these were also to be short-lived as in May, the squadron moved to Calcutta, receiving Hurricanes, although a few Audaxes were retained for communications purposes. The squadron then moved to Bengal to provide fighter cover for the area until January 1943, when it began ground attack operations over Burma using advanced bases, where necessary. The squadron moved to Burma itself in April 1943, where it continued it ground attack operations but also resumed an air defence role. In February 1944, rumours of an impending carrier borne attack led the squadron being sent to Southern India to combat this, but the attack never happened and in Jun it converted to the Thunderbolt. It returned to operations over Burma in September continuing its ground attack role until disbanding on 30 June 1945. Plans for its formation appeared in January 1918 for deployment to Egypt by the end of May as a DH9 equipped bomber unit. Deployment was later changed to June and then August and on 31 May, its formation was deferred, as a result it never formed in WW1. Formation was eventually authorised on 17 October 1941 as a transport unit but this was later changed to a Liberator equipped bomber unit in Egypt. Its ground personnel began arriving in February 1942, but when no aircraft were received these were attached to No 104 Squadron. 147 regained its personnel in April but the lack of aircraft led to them being attached to No 159 Squadron from April and then No 160 Squadron from August. The squadron was eventually disbanded at Shandur on 15 February 1943, when its was absorbed into No 178 Squadron. The squadron eventually reformed as a flying unit on 5 September 1944 at Croydon in the transport role. Operating as part of Transport Command's No 110 Wing, it flew Dakotas on both freight and passenger services between the UK and various destinations in liberated Europe. Ansons were received to supplement the Dakotas on the shorter ranged destinations in September 1944 and the squadron maintained these services until disbanding on 13 September 1946. The squadron was reformed on 1 February 1953 by redesignating No 1 Long Range Ferry Unit. it was mainly involved in ferrying jet fighters to various part s of the world starting with Sabres from Canada to Britain and Germany, Venoms to both the Middle as Far East and Swifts and Hunters to Germany. It was disbanded by being amalgamated with No 167 Squadron on 15 September 1958 into the Ferry Squadron. "I served in the RAF. 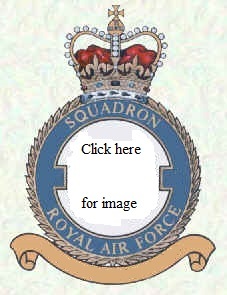 for 4 years from 1951 to 1955 (initially) stationed at Abingdon from there I was transferred to 147 Sqn. Being a Turbine mechanic I then did a course on the J47 engine at North Luffenham, Rutland. When I returned I cleared from Abingdon I had 3 days leave, came back to camp and next day boarded a HP Hastings with the rest of the ferry sqn and off we went to Canada via Iceland, Greenland, Goose Bay,( Labrador) then finally landed at Bagotville, (Quebec) half of us stayed there the others flew to St. Hubert, Montreal. This was winter time so we had to wait until the snow cleared before we could receive F86 Sabre jets from the factory (Canadairs) outside Montreal. When we received 72 aircraft which had taken about 7-8 weeks to be delivered and air tested for 5 hrs by our pilots then we were ready to start ferrying the aircraft to England. When the aircraft took off from St. Hubert in groups of 4 they flew to us at Bagotville where they were serviced and repaired if any faults were found of course, meanwhile the other group then with their gear flew to Goose Bay ready to receive the planes from us and then we would fly to Bluey West in Greenland, they would fly to Iceland and we would fly to Scotland and they of course to England, then we all had some leave and returned to camp and we started all over again, I think we ferried about 500 sabres that I think went to Europe." Formed on 10 February 1918 as a night bomber unit at Andover, equipped with FE2b and 2d aircraft, which were taken to the Western Front in April 1918, where it began attacks against German airfields, communications and other targets behind the lines. It continued to operate the out-dated FE2s until the end of the war and it eventually returned to the UK in February 1919, disbanding at Tangmere on 30 June 1919. The squadron reformed on 7 June 1937 at Scampton as a light bomber squadron equipped with Audaxes. However, within a month these had been replaced by Wellesleys, but it soon became obvious that this aircraft possessed inadequate defences for a European war and these were replaced by Heyfords in November 1938. Modern equipment arrived in March 1939 in the form of Wellingtons, however, the following month it became a Group Pool Squadron. In this role it acted as an operational training unit for the other units in its group, operating Ansons as well as the Wellingtons, moving to Harwell on the outbreak of war, where on 9 April 1940 it was disbanded by being redesignated No 15 Operational Training Unit. Following the entry of Italy into the war on 10 June 1940, detachments of UK bomber squadrons had been sent to Malta to carry out attacks against targets in North Africa. Three of these detachments (from No 38, 99 and 115 Squadrons) were amalgamated into a new No 148 Squadron on 14 December 1940 at Luqa. It continued its attacks against targets in Libya, Sicily and also the Italian mainland, from Malta, until March 1941 when it moved to a new home at Kabrit in Egypt. From here it supported the 8th Army during its battles for control of the North African Desert, operating from a number of desert landing grounds. On 7 December 1942 a detachment of 12 Wellingtons was sent to Malta, leaving six at LG167 in Libya, which were transferred to No’s 30 and 70 Squadrons. A week after arriving in Malta, the squadron disbanded, with the crews being absorbed by other units on the island. Three months later on 14 March 1943, No 148 Squadron reformed at Gambut in the ‘Special Duties’ role, equipped with Halifaxes and Liberators. It was now responsible for supplying Partisan groups throughout the Balkans and as far afield as Poland as well as undertaking normal bombing missions when not otherwise occupied. With the end of the war the squadron re-equipped with standard bomber Liberators, moving back to Egypt in November 1945, where it disbanded on 15 January 1946. It was soon back on the battle order, when it reformed at Upwood in November 1946, equipped with Lancasters, with Lincolns arriving in February 1950. The Lincolns were used operationally in Malaya as part of Operation Firedog during 1954 and 1955, but the unit disbanded again in July 1955. Its final incarnation began on 1 July 1956 at Marham as a Valiant V-bomber unit and again used this type operationally during the Suez crisis of 1956. However, when metal fatigue was found in the main spars of the entire Valiant fleet, the type was grounded and No 148 disbanded in April 1965. Formed at Ford on 3 March 1918 in the night bomber role, equipped with FE2bs, it moved to France in June and carried out raids against targets in Belgium and Northern France until the end of the war. Remaining in Germany from December 1918, it moved to Ireland in March 1919 and disbanded there on 1 August of the same year. It was reformed from 'B' Flight of No 99 Squadron on 12April 1937 at Mildenhall, where it remained until April 1942. Initially equipped with Heyfords, these were replaced by Wellingtons in January 1939, which it used on some of the earliest daylight raids of the war, but following the mounting losses experienced on these, it moved to night raids in April 1940, along with the rest of Bomber Command. In November 1941, the squadron converted to Stirlings and in April 1942 moved to a new base at Lakenheath. Continuing to operate as part of Bomber Command's main Force the squadron moved to Methwold in May 1944, where it re-equipped with Lancasters in August and where it remained until April 1946. Having been retained as part of the post-war RAF, it moved to Tuddenham in April 1946 and then in November to Stradishall. In February 1949, it returned to Mildenhall, where it re-equipped with Lincolns in October, remaining there until disbanding on 1 March 1950. The squadron reformed on 14 August 1950 at Marham as the RAF's first Washington bomber unit, moving to Coningsby in October. These were intended as a interim nuclear bomber pending the arrival of the RAF's own jet bomber, the Canberra. These were received in March 1953 and in August of the following year, it re-located to Ahlhorn in Germany, where it joined No 125 Wing. The following moth it moved again, this time to Gutersloh, where it disbanded on 31 August 1956. Aircrew of 149 Squadron, signature not clear but last 5 letters of surname are iplow. By April 1918, there were two squadrons operating in Salonika, No 17 and No 47, both operating a variety of types and both carrying out reconnaissance and fighter operations. On 1 April the fighter flight of each squadron was withdrawn and combined to form a new unit, No 150 Squadron. The squadron remained in Macedonia after the war until disbanding on 18 September 1919. When the squadron reformed at Boscombe Down on 8 August 1938, it was as a Battle equipped light bomber unit. Moving to Benson in April 1939, it became part of the Advanced Air Striking Force shortly before the outbreak of war and moved onto the continent on 2 September. Until the German attack of May 1940, it flew reconnaissance and leaflet dropping operations, but after the attack it was involved in offensive operations in an attempt to stem the German advance. Withdrawn from France in mid June 1940, by the beginning of July it was bases at Newton, where in October it re-equipped with Wellingtons. Until December 1942, the squadron flew night raids against a variety of targets in occupied Europe and Germany, initially from Newton before moving to Snaith in July 1941 and then Kirmington in October 1942. In December 1942, the squadron was withdrawn from operations in Europe and sent to the Middle East. Operating from Blida, it carried out attacks against Axis targets in North Africa, Sicily and Italy. In December 1943 it moved to bases in Italy, where it remained until disbanding on 5 October 1944. However, the squadron was soon revived, when 'C' Flight of No 550 Squadron at Fiskerton was renumbered 150. In November the squadron moved to its final wartime base at Hemswell, operating its Lancasters from there until the end of the war, disbanding on 7 November 1945. The squadron only re-appeared in the RAF's post-war order of battle once, when it became a Thor equipped Intermediate Range Ballistic Missile unit at Carnaby from 1 August 1959 to 9 April 1963.